It's probably my fandom for Downton Abbey that helped get me hooked on Netflix's The Crown. Both are British period dramas that touch on nobility (to varying degrees) in rather intimate detail. But where Downton is a well-crafted story on its own, The Crown is somewhat more empowered by bits of truth here and there. And it's that promise of truth woven intot the fiction that adds an extra bit of thrill to things. The first season focused on Queen Elizabeth's life before she ascended the throne and the early days of her rule. It had a lot of great moments and showed many facets of her life, which made for some great storytelling moments. But it also depicted the tensions stemming from the significant difference in status between the Queen and her husband. This second season revisits that challenge and explores it further to a significant degree. And that comes with its own share of drama and intrigue. Synopsis: The Crown is a historical drama series created by Peter Morgan for Netflix. Each season runs for ten episodes. The season begins in 1957 with Elizabeth (Claire Foy) and Philip (Matt Smith) discussing their troubled marriage and a reminder that divorce is not an option available to them. We go back 5 months when Philip is about to begin his royal tour while Elizabeth is sset to stay in England. This is also the time that Egypt decides to nationalize the Suez Canal, causing a major international incident that threatened Britain's interests in the region. The season is colored by many other events in the lives of the Windsors during this period. There's the Princess Margaret's (Vanessa Kirby) various romances. There's also the suspicion of an affair hanging over Prince Philip across his travels. And a secret buried previously that could now threaten the integrity and reputation of the Royal Family as well. 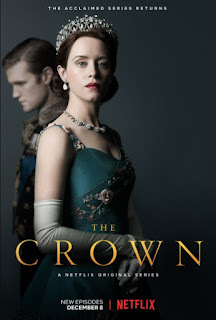 What I Liked: Claire Foy is a gem and a gift to the television viewing public at large. I can't necessarily speak to the "accuracy" of her portrayal but she does embody the character amazing well. She carries herself with all the dignity of a queen but also the internal conflict of a young woman with the burden of the crown and the challenge of raising a family all weighing heavily on her shoulders. She does this to amazing effect each and every time and she remains to be the best reason to watch the show. But this second season really gave a lot more screentime to Matt Smith as Philip and Vanessa Kirby as Margaret. Not only did this help flesh out their respective characters more outside their direct relationships with the Queen, but also gave them some great on-screen moments of their own. And this only added to the intriguing complexity of their stories. What Could Have Been Better: There were definitely some moments that felt that like were presented with the weight of historical fact but were actually rather liberal interpretation of events on the part of the writers. And should you take things at face value as so many other parts of the show are so close to established history, it can be easy to muddy the waters. Fact-checking should be easy enough but you now not everyone takes the time. And the big crisis at the end off the season is definitely quite fast and loose with speculation presented as story. I know there's mostly history to use as a guide in terms of how the different characters should be portrayed, but I also can't help but feel that the government serving on behalf of the Queen really wasn't all that compelling. I know there were some questionable decisions that were of course historical fact but I sort of wish that the characters didn't have to feel lopsided in terms of effectiveness of resolve and being properly statemanly? Words fail me at the moment. TL;DR: The second season of The Crown continues our journey through the history of the Queen. There's some great talent brought together in this show and they make some beautiful television together. Thus the season gets a full 5 moments of the Queen being effortlessly brilliant out of a possible 5.